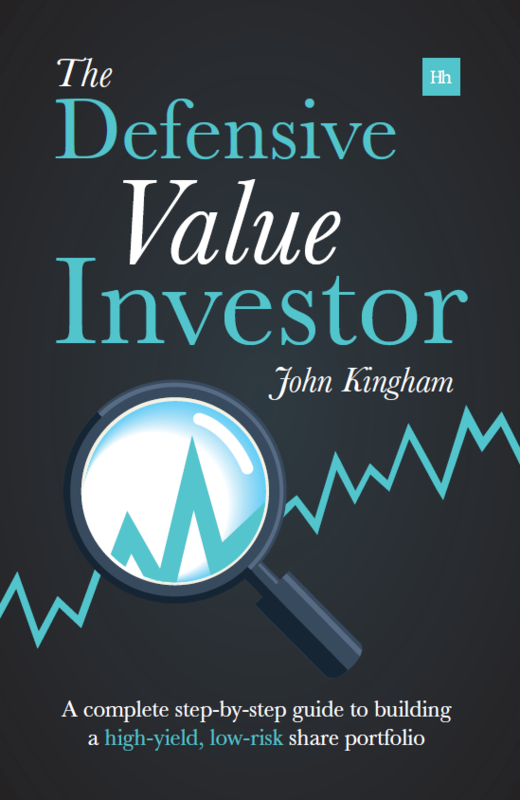 When I added Amlin PLC to the UKVI model portfolio three years ago it was a classic case of buying a good company at an attractive price because it was facing some short-term problems. Three years later and the investment has produced a very nice return of 25% annualised, largely thanks to the fact that Amlin has recently been taken over. Amlin PLC is in part a catastrophe reinsurer and in its 2011 annual results it announced a loss for the year, largely due to exceptional catastrophe losses which came to £500m rather than the expected £170m. The market’s initial reaction was to mark down the company’s shares causing the price to fall by more than 30% at one point. When I reviewed the company in February 2013, shortly before the 2012 annual results were announced, Amlin’s share price had recovered somewhat, although it still had a dividend yield of 6%. For a variety of reasons I thought dividend growth was more likely than a cut, and that’s exactly what happened. 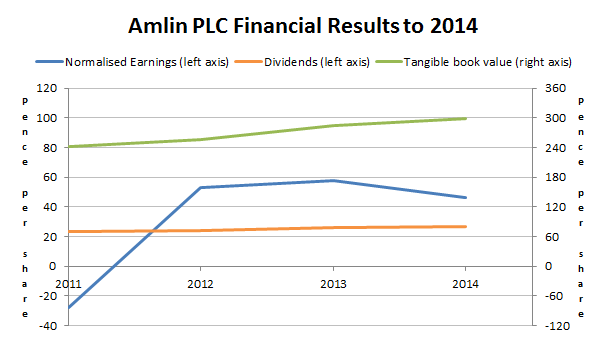 Between 2013 and 2015 Amlin’s profits recovered and its book value and dividend grew strongly. However, Amlin is now being taken over by Japanese insurer Mitsui Sumitomo Insurance, and so this very successful investment has now come to an end. Insurance exists because we know that unpleasant things will happen, but we do not know exactly when or where they will occur, or just how unpleasant they will be. There is a large element of randomness to life’s unpleasantries and, because of this, several unpleasant things which are entirely unconnected can all happen at once, or at least within a short space of time. That is exactly what happened in 2011 when massive earthquakes hit Japan and New Zealand. 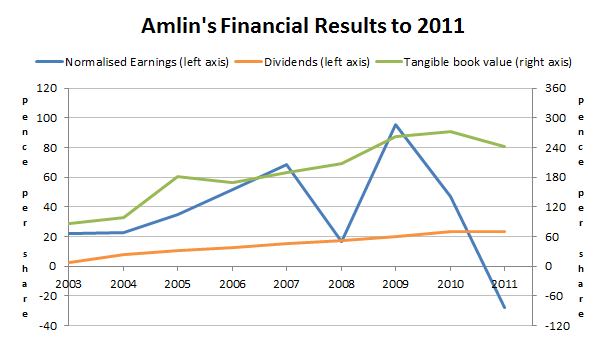 As a result of its exposure to those events, Amlin posted a loss in 2011 and the share price slumped dramatically. By the time I looked at the company in February 2013, its loss of 2011 was some distance in the past. The share price had recovered from below 300p to around 400p, but even at that price the dividend yield was still worryingly high at 6%. It seemed that the market was still very wary of Amlin. The green highlighting shows that Amlin beat the FTSE 100 on almost every measure, with faster, higher quality growth, combined with high profitability (return on equity), low valuations and a high dividend yield. Although I didn’t use this ratio at the time, one key reason for Amlin’s strength in the face of multiple catastrophe’s is its low premium to surplus ratio. This is the ratio between an insurance company’s net earned premium (net of reinsurance) to its tangible book value, where tangible book value is a good measure of an insurance company’s ability to absorb unexpectedly large losses (this is just one of the ratios that I use to measure leverage and debt). Amlin’s premium to surplus ratio had averaged around 1.2, which is low relative to other insurance companies and well below my rule of thumb minimum of 2. 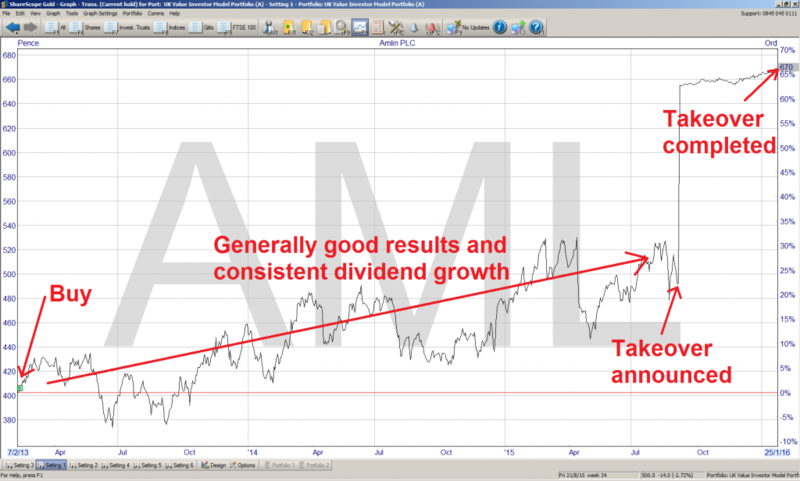 I thought the most likely outcome for Amlin was that it would continue to perform as well as it had in the past, that it would continue to grow its dividend and that eventually the share price would recover. Amlin’s three years in the portfolio seem to have passed very quickly, most probably because every update was positive. Right from the 2012 annual results, which were published just a month after Amlin joined the portfolio, management were upbeat and the dividend grew , pushed forward by broad progress across the company. Usually I like to dig into the details of how a company progressed through its holding period, but in this case there is little point. Amlin recovered and subsequently performed relatively well, as the chart below shows, and there is not a great deal more to add. In September 2015 Amlin announced that it was to be taken over by the Mitsui Sumitomo Insurance Company (MSI) for 670 pence per share. As is usual, the share price quickly jumped up to slightly below that level (slightly below to reflect the small possibility that the deal would not go ahead). Those are all valid reasons to agree to a takeover, but I would perhaps disagree with the statement that it offers excellent value for shareholders. Although I cannot realistically know how Amlin would have faired if the takeover had not happened, and more specifically if it had to continue without the “increased scale and financial muscle that will be required for long term success in [the insurance] industry”, I can say for certain that the takeover price of 670p is some way below the fair value price implied by my stock screen. Given Amlin’s history of consistently fast growth and impressive profitability, its fair value according to my stock screen is some 50% higher at just over 1,000p. At that price the company would have a dividend yield of 2.7%, which I think is more appropriate for a high growth company than the 4% yield given by the takeover price. However, I have no say in the matter and so the shares have been de-listed and will be sold for 670p each at some point during February. I will, as usual, be reinvesting the proceeds of this sale into yet another solid dividend payer which appears to be trading at an attractive valuation relative to the rest of the market. 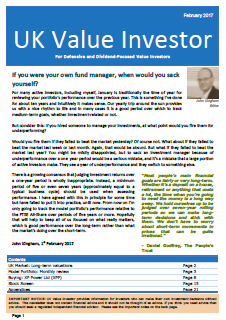 Note: You can read the full pre-purchase review of Amlin in the February 2013 issue of UK Value Investor (PDF). What can I say here? Thank you. You were the one that brought to my attention general insurers like this and not only this, Admiral as well. I was ignoring them before. However these firms have a good renewal business, margins have improved and whitsplash claims have reduced – that was the moment when I bought into these general insurers. What am I doing with the money now? Well, I thought to reinvest it in Berkshire Hathaway. The BH shares are 19% down from their highest, offering me a relative good point of entry. I intend to build a 7% holding in BH over the next 3 years. Obviously there is the risk Charlie or Warren will die, but I am not that worried of it. In the end, those many businesses bought over the years could be spun off and get 30-40% more in the process. Hi Eugen, no need for thanks; I’m just glad that you found some of my ideas helpful. As for BH, I assume you mean you’re going to invest 7% of your portfolio in to BH rather than that you’re going to buy 7% of BH (which would be more than £10bn I think)! It will be a sad day when Buffett and Munger die, but the odds are certainly stacked against them now. BH post-Buffett will be very interesting and I think you’re right; he has basically built the company to run for a century without the need for too much fiddling. Yes, 7% of my portfolio. At this moment with the use of Amlin proceeds I am just at about 1.33%. Markets seem to discounting BH, because they have exposure to some of the old industries: energy, railroads, however they have added many other good businesses there like Heintz, Duracell and Precision Castparts. Some companies are cyclical (like the latest 10.8% position in Phillips 66 – the biggest rafinery business in Texas), some are very defensive. I do not expect the downtrend for the BH share price to change soon, so there may be many other opportunities to buy in the next few years. interesting post. I bought into Amlin last year not that long before the takeover was announced, lucky me. Also bought Novae at the same time. Recently I started to buy into BRK-B. So nice to read a post thats agreeing with my beliefs. Hi Andy, lucky or not, it always feels nice to see one of your holdings gain 30% or so in a single day!